A note about the title: this book is the whole of the Public Works Trilogy. As much fun as it would be to encourage you to button hole the author to demand the next two volumes, Sewer, Gas and Electric is a standalone novel with a misleading subtitle. 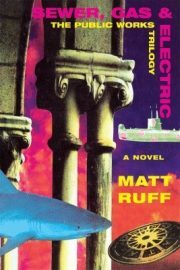 I remembered liking 1997’s satirical Sewer, Gas & Electric almost 20 years ago so I was looking forward to rereading it. That may sound ominous and it should. I suspect the issue is not the book so much as it is me but unfortunately I seem to be stuck with being me 24/7.